I have had the opportunity to use a few Progeny Press literature guides in the past, as part of the Schoolhouse Review Crew. Mostly, I've worked with high school titles. We've certainly enjoyed them, and they are part of my ideal lit program now for high school (I like to use at least one Progeny Press title each year. I've never had the opportunity to get a look at one of the guides for little guys though, until now. Since we were studying the colonial period in history with my 2nd and 4th graders, using The Courage of Sarah Noble Study Guide seemed perfect. It was. This guide is intended for use with 1st-3rd graders, so I had one child solidly in that range, and another a bit older. The basic outline of the Progeny Press guide was quite similar to the High School Guides we've done in the past (see my review of The Screwtape Letters Study Guide, but definitely at a more basic level. I'll walk through it a bit. Note to Instructor. In this case, there appears to be an error, as it is talking about middle and high school. I wasn't sure if the suggestions about timing were applicable to early elementary or not, so I basically ignored this and jumped in. Synopsis. This is a brief, one paragraph summary of the book. Essentially, this book is about a little girl in 1707, who accompanies her father while he heads out to build a cabin for his family. I've read this story to my older kids, so I really didn't need this. About the Author. I did read this short (two paragraph) bio to the kids, and we talked a bit about Dalgliesh's background. Background Information. Another very short little section, which is appropriate for this book, talking about what America was like in the early 1700s. I read it to the kids and compared it to what we've read in history. Before-you-read Activities. This had us doing a little bit of "pique their interest" stuff, like talking about what it would be like today to go knock on a stranger's door and ask for a place to stay. As-you-read Activity. We talked about this the next day, as we started working through the book. We did all of the material above on the day before we were to pick up the book from the bookmobile. That is one thing I like about these studies -- most use easy-to-locate books that you can get from a library. Once we had the book in hand, we were able to sit down and read two chapters at a time, and work through the sections in the Study Guide. My children are big into discussion, and we did all of the work together. Each two-chapter section included vocabulary work. My kids liked the multiple choice types of questions, hated when I made them define the words themselves. It is good for them, but I admit, I was glad that it wasn't that way for every section. After the vocab, there are a series of questions. Some are very "reading comprehension" related. "What did she do..." "What did she say..." types of things. Some require a bit of thinking. "Why do you think..." Those were our favorite questions. It goes beyond just the literal, what happened in the story, and got us discussing motives, how things were different, and such. Some are more devotional. "Read Deuteronomy 5:16. ... in what way can you honor your father and/or mother?" The kids liked these a lot too. Occasionally, there were even sections that did address "lit study" in some way. There is a section on imagery, similes, and metaphors. My kids have heard their big brothers doing things like this, and I really loved how these concepts are being introduced, gently. Something I really loved for these little guys, though, is that at the end they have some fun wrap-up sections. 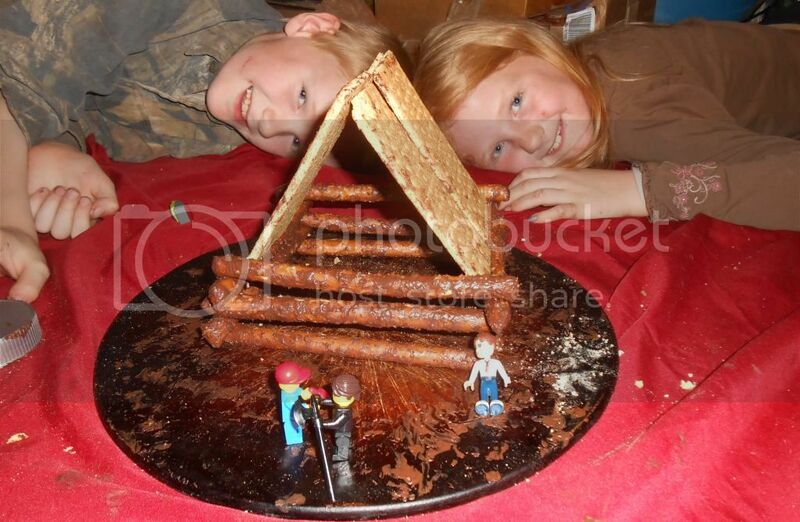 Activities, Arts, and Crafts: this suggested baking cornmeal biscuits (we plan to do this, but haven't yet), building a pretzel log cabin (see below), playing a colonial era game (recruited the big brothers for this! ), and a crossword puzzle. Suggestions for further reading: this included a whole lot of titles we've already read (or are coming soon) in our history program, so obviously, I think this is a well put-together list. And there are answers. Can't say that I really needed these, but if my kids were reading the book and doing the Study Guide independently, these would be very handy. So -- we altered the instructions, used big pretzel rods, and used Hershey's Chocolate Spread for mortar. We tended to use this material a couple days a week -- reading two chapters, then doing the study part. Since the entire book is 11 chapters (with three chapters covered together for the last section), with a day added for the pre-reading activities, that meant three weeks to work through the book, and a final week for things like pretzel log cabins. At $11.99 for the guide, I can totally see using one or more of these a year in these younger ages, just to get a nice, gentle introduction to some of the ideas of literary analysis. Other members of the Crew have some pretty amazing reviews of various titles at all of the levels, including two other for younger elementary ages (Frog and Toad Together and Uncle Jed's Barbershop). Click the link to go learn about those!